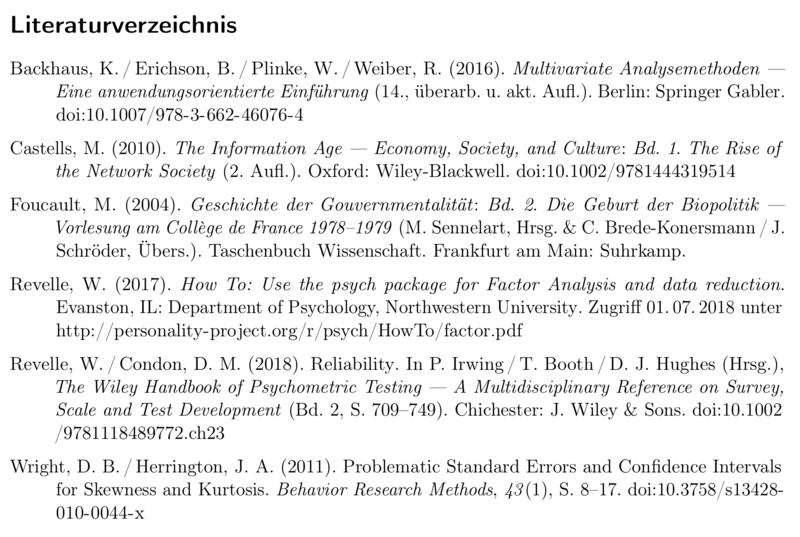 If there is a book or bookchapter that's got a doi, location+publisher won't show up (for example check Backhaus et al. ; Castells; Revelle/Condon), but without doi, location+publisher show up (for example check Foucault. Is there a possibility to change that? It should look like: »location: publisher. doi:12345« (for example »Oxford: Wiley-Blackwell. doi:10.1002/9781444319514«). Maybe you also notice, that in the case of Castells the volume number is not shown, too, whereas for Revelle/Condon without doi it is shown, but in the arabic number, not the roman number (even if that's the information of the bibentry). In the case of Foucault the volume number is not shown although there's no doi. Could that be fixed, too? Maybe this has got to do with changes to an APA feature? Or does it have to do with the zotero-import of my bibentries? See, before this problem happened, all books would be imported as »@book« (Backhaus et al. ), whereas now it's »@mvbook« (Foucault). I'm using APA-Style with biber as backend for biblatex. All help is much appreciated. uniquelist      = false,    % immer nur 1. Autor + et al. 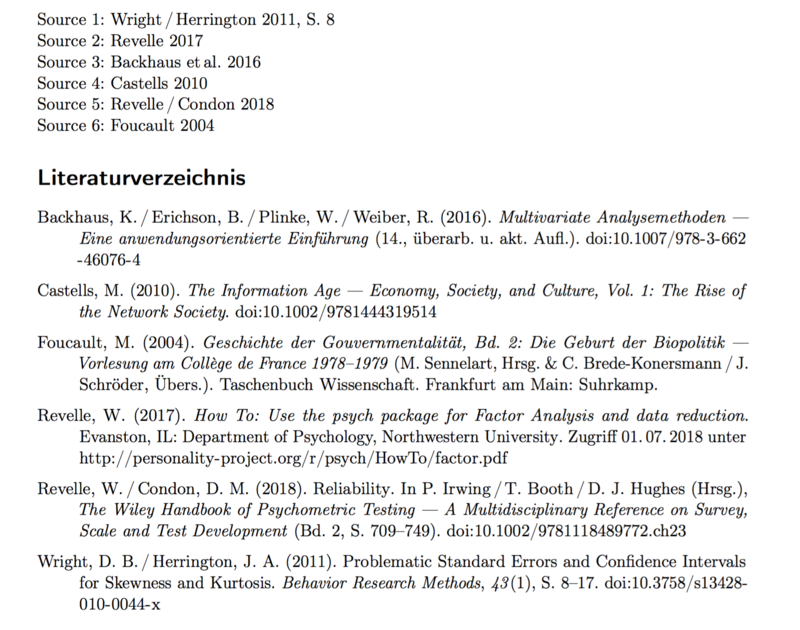 % increase vertical space between bibliography items. % Subtitel nach Titel mit "––"
It is a feature of APA style that location and publisher are dropped if the DOI is present for chapters like @incollection or @inbook. That can be turned off by redefining the macro location+publisher. (note that I also split up fields into ...title and ...subtitle where appropriate). Similarly volumes (in plural) only makes sense if a work consists of several volumes, and that will always be a @mvbook/@mvcollection. Your entries, however, refer to just one book and so volumes is not really needed (except as an volume 2 of 3 sort of thing, which I don't think any style does). The two code-level changes have been marked with today's date 2018-09-24 so they are easier to spot. Not the answer you're looking for? Browse other questions tagged biblatex bibliographies biber apa-style doi or ask your own question.